The Fonseca Cosacos is a creamy and tasty mild-medium Habanos, of Corona format, 5.3” (116mm) long, of 42 ring gauge, and comes in a 25 cigars box.Like all Fonseca, it comes in a classy white tissue that is closed with the gold Fonseca band. 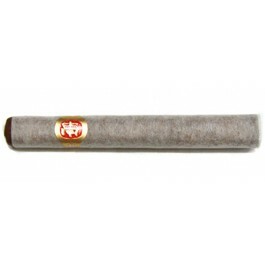 This cigar is a favorite for experienced smoker, but can also appeal to new comers to Cuban cigars. It is a very smooth smoke which has a great draw and great flavor profile. There is a lot of wood, of earth, hay, but also lots of sweetness from chocolate and vanilla. There is also a nutty and more floral character. Overall, it is a great go-to cigar for an afternoon break or for a game of golf. The Fonseca Cosacos is a very good option for a medium cigar with lots of flavors. • A perfect cigar for beginners but also for experienced smokers that enjoy its complexity. • Very mellow smoke with lots of wood, earth, hay and lots of sweetness (chocolate, vanilla. This cigar simply delivers a great smoking experience for an outdoor activity or a mid-day break. The Fonseca Cosaco, like all Fonseca, is wrapped in a beautiful white tissue paper with the gold Fonseca band on it. Once the band opened, the white tissue paper reveals a well-rolled cigar which wrapper has a nice dark brown (Maduro) color. There is a nice sheen of oil on it, the cigar is very smooth, and there are few tiny veins on the surface. The packing of the cigar is even and well done, the triple cap, typical Fonseca, is flat and blunt shaped. There is no hard spot on the cigar, just enough give between the fingers. The wrapper smells of sweet tobacco, some light hay. Once cut, very easily by the way, there is also some spice on the nose. The cold draw gives some chocolate, sweet tea, some wood and a hint of flowers. The draw is flawless right away, lighting the cigar is fine. With the first puffs rich flavors come to the palate, some toasted nuts, vanilla and some floral characteristics. It starts off very smoothly, the burn line is clean and even and each puff releases a generous amount of white smoke. The cigar starts off with mild strength flavors, aromas of tea, spices, wood and leather. The flavors are rich, smooth with a bit of sweetness from flowers and chocolate. The finish is long. The strength of the cigar increases as the cigar goes, the burn line is sharp and a nice gray ash is building up on the foot. In the middle third, the strength of the cigar picks up, and it is now definitely a medium body, the flavors are still very rich and delicate. The tea faded, leaving more space for chocolate, coffee, vanilla, earth, toasted nuts and hints of wood. The finish is still long and herbaceous. In the final third, the flavors are still amazingly rich, with still lots of nuts, wood, earth and pepper. The finish is spicy, with lots of barnyard, wood, and roasted coffee, roasted nuts and toast. The body is well in the medium range, and the draw continues to be perfect until the end. In summary, it is a very enjoyable smoke that has very rich flavors and a medium body.